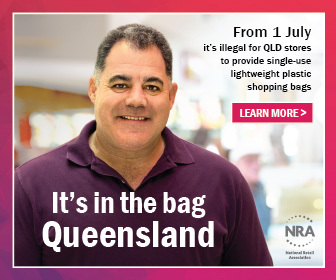 Queensland great Mal Meninga will be on the hustings in Brisbane today, as he joins forces with the National Retail Association (NRA) to launch a state-wide education campaign asking consumers to get behind the Queensland Government’s July 1 ban on single-use lightweight plastic shopping bags. The Bundaberg-bred coach, businessman and speaker, who grew up on the state’s treasured coastal areas, said tackling plastic pollution should be a priority for everyone who calls the Sunshine State home. “The number of plastic shopping bags used by Queenslanders these bags handed out is nearing a billion each year – most of which sits rotting in landfill for anywhere between a decade through to a thousand years,” Mr Meninga said. “But around 16 million of these bags never even make it to a rubbish bin, and are instead littered throughout our precious environment. The equivalent in weight to 96 small cars’ worth of plastic bags wind up in our marine environment where they wreak havoc on the local ecosystem. “We simply cannot afford to stand by and let this rampant degradation of our environment continue,” he said. NRA CEO Dominique Lamb said retailers had long-supported the idea of industry-wide action to try and combat toxic plastic bag pollution, however those who’d launched their own bans had often found it tough getting customers to embrace the idea. “Our industry is behind the State Government for making this a non-negotiable for all stores right down to the smallest takeaway outlets, local markets and online stores, as it’s a crucial step toward changing overall consumer behaviour,” Ms Lamb said. In the decade following the advent of the throwaway polythene bag in 1950, annual global plastic production reportedly reached 5m tonnes, and has been growing for more than 60 years. Without radical action, the volume of accumulated plastic in the oceans is forecast to become greater than that of fish by 2050, according to a 2016 report by the World Economic Forum. “We know we’ve reached a tipping point and the retail industry is right in the thick of it as consumers demand more transparency into how the products they buy are produced, so they can support brands with ethical production methods and environmentally sustainable practices. From July 1, no retailer in Queensland will be allowed to hand out plastic bags under 35 microns thick, or they risk fines of more than $6000 per offence. Ms Lamb said consumers will need to prepare by either bringing their own reusable bags, or expecting to pay a small fee of around 15 to 20 cents for a basic reusable option, through to as much as five dollars for locally-made jute or hessian bag. Ms Lamb also asked consumers to understand that retailers were going through this transition as well, and to please be patient and courteous with retail staff while we all get used to new bags and processes. “It’s up to all of us to do our bit. It’s a small change in our routine for a big impact on Queensland’s environment,” she said. Retailers, shopping centres and media across Queensland are encouraged to access and use the campaign materials, which include digital imagery, social media, videos and articles.